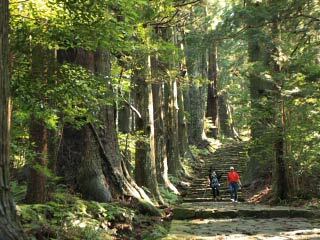 Daimonzaka (熊野古道大門坂) is one of Kumano Pilgrimage Routes located in Nachi. It leads to Nachi Grand Shrine and Seiganto-ji Temple. It is also a part of UNESCO World Heritage Site of Kii Mountain. This path has a beautiful cedar avenue, and remains the original stone floors. It is about 500m long 100m difference of elevation. Many people used this path for worshipping the scared place. 2. use bus to Daimonzaka. The cedar trees are so beautiful along this path, especial at the gate there are twin cedar three called "husband and wife cedar threes," 800 year-old tree. The view of the site has not changed over a thousand years.